I was looking for a basic 100% Whole Wheat and a 100% Jaggery Cake, a quintessential all rounder healthy Healthy Whole Wheat Cake, which tastes great,which doesn’t feel heavy or lumpy and also which doesn’t have the characteristic raw whole wheat taste.I definately didn’t want a cake which I am forced to eat in the name of health.I would rather just eat a cucumber for that.I basically wanted a Utopian 100% whole wheat and 100% Jaggery Cake. Most whole wheat cakes I have had are weirdly sunken in the middle or are way too dry.If they are good they usually contain corn flour ,which I have nothing against,in fact this cake was supposed to contain it but I couldn’t find the box in time and I am not the most patient person on the planet so I just omitted it.And I am happy I didn’t find it cause now I can say that this is a 100 % refined flour free cake. Lately,I have been reading a lot of cook books.My favourite being “How to Bake Everything” by Mark Bittman.This book teaches you the distinction between the different flours,on how you need gluten in certain recipes like bread and how to work with and around it.Here I also learnt how to substitute refined flour with whole wheat flour.The needs of both flours are different and you cannot blindly swap the two.You have to make adjustments to account for the nature of ingredient you are swapping and that’s what I did.Whole wheat flour needs much more moisture than refined flour.Keeping that in mind I have added more milk to this Healthy Whole Wheat Cake because of which its super moist. The other change I have made is with how I incorporated the jaggery.Ideally the white sugar is mixed with the eggs but jaggery tends to have lumps in it and also has a lower melting point so I added the jaggery to the hot milk instead of the eggs.By doing so the jaggery melted and mixed better in the cake batter instead of being Lumpy and grainy. For those of you who don’t know what jaggery is-It’s unprocessed sugar made from sugarcane.Also called palm sugar or Gur. You can use coconut sugar if you can’t find jaggery. Variants to this Healthy Whole Wheat Cake with strawberries. This is a basic whole wheat tea cake recipe.You need not stick to adding strawberries to it but can swap them with chunks of chocolate, nuts or any other cubes of fruit like-mango,blueberries,pineapple etc.This can also be made into muffins or cupcakes but the time will vary according to the size of the muffins.I would say around 15-20 minutes but you need to start watching them at the 10 minute mark. 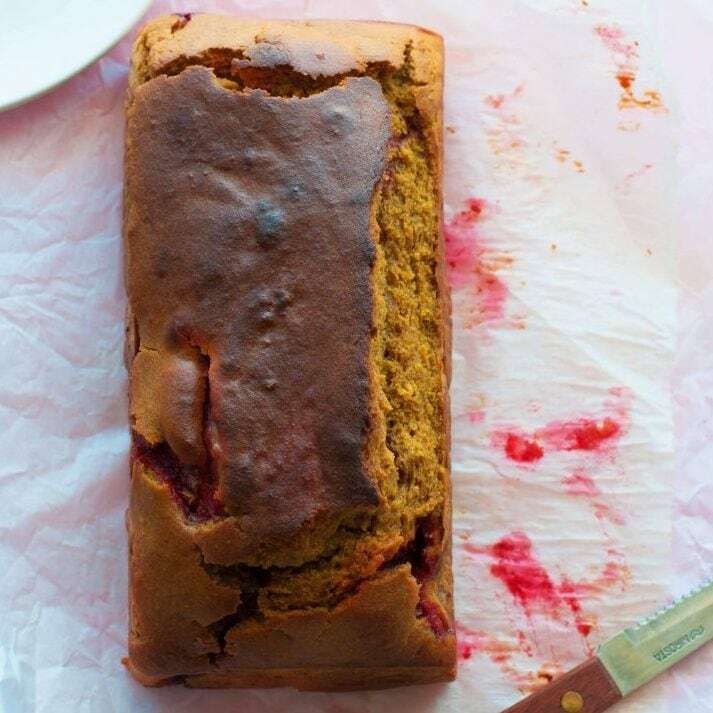 Why use Whole Grain Wheat Flour instead of Refined flour for this Healthy Whole Wheat Cake? The question probably should be why use whole grain flour at all instead of maida or refined flour because lets face it, refined flour leads to a better texture and crumb but the fact is that the process involved in making the flour rids it of all the essential nutrients and fibre leaving it unnaturally hollow in nutrient content. For everyday baking and consumption its much better to use whole wheat flour because its first, its higher in fibre as the germ and bran has not been removed from it.It is higher in glycemic index which means that it gets absorbed slowly in your systems and keeps us full longer unlike its starchy cousin -refined flour which is digested very quickly.And third and most important, its high on nutrient content. That doesn’t mean I don’t bake with refined flour.I do but those are more celebratory cakes made only once in a while.If you are looking for an everyday tea companion or to send to school in your child’s tiffin box for snack then I would definitely recommend this recipe. Can this Healthy Whole Wheat Cake be made without Jaggery? Yes,it can.Jaggery is unprocessed sugar from natural sources.It’s usually made with Sugarcane,coconut,dates or Palm.The logic of using jaggery instead of white sugar is the same as using whole grain wheat flour instead of refined flour.Sugar is empty calories but jaggery which is a much more unrefined form of sugar contains a lot more nutrients and vitamins.However don’t let anything fool you into thinking its lesser calories.It’s definitely healthier than white sugar but at the end of the day it’s still a lot of calories. 100 % Healthy Whole Wheat Cake with strawberries.It has no refined flour or refined sugar. Heat the milk on medium flame.Add the butter and jaggery to it.Let it come to a bubble and switch the heat off. Let the milk mixture cool.Keep mixing while you prepare the other ingredients. Mix in the baking powder, baking soda and the whole wheat flour in a bowl separetly. Break two eggs in a bowl and whisk.Trickle in the whisked eggs to the hot(but not boiling) milk mixture slowly and fold in. Once the eggs have been folded tip over the dry ingredients and fold. Netx,Add 2 tsp vanilla essence and the cut strawberries. Bake in a preheated oven at 180 degrees for 30-40 minutes till the skewer inserted in the middle comes out clean. I usually prepare my pans by first oiling them and then lining with butter paper. Other healthy desserts that you will love! It is amazing 😊😊it’s my favorite! What is the shelf life of this cake l?